Expanding the scope of chemical mixtures covered by the PSM Standard. Read our earlier article about these three enforcement memorandum and the resolution by settlement of a legal challenge to the RAGAGEP interpretation. On June 5, 2015, OSHA issued an enforcement memorandum regarding PSM and Covered Concentrations of Appendix A Chemicals, which substantially revised OSHA’s policy on the concentrations of components of chemical mixtures that trigger the coverage under the PSM Standard. Appendix A of the PSM Standard lists the “highly hazardous chemicals” that are covered by the Standard when they are present in quantities that exceed threshold amounts identified in Appendix A. For some of those chemicals, Appendix A lists a specific concentration level at which that chemical must be present in a mixture before you have to count the chemical for PSM coverage purposes. Most of the chemicals in Appendix A, however, do not list a specific concentration level for which mixtures containing those chemicals can be PSM-covered. For decades, OSHA has applied a “commercial grade” or “pure grade” standard for setting the triggering concentration for mixtures with those chemicals. OSHA defined “commercial grade” as the maximum concentration of the chemical commercially available. Generally speaking, that meant the chemicals had to make up 99% of a chemical mixture before the mixture counted towards PSM coverage. OSHA’s June 5, 2015 memorandum abandoned that decades old “commercial grade” standard, and substituted in what is being referred to as the “1% rule.” As the name suggests, rather than counting for PSM-coverage purposes only those mixtures made up of 99% of an Appendix A chemical, OSHA would now count Appendix A chemicals in mixtures when they make up only one percent or more of a chemical mixture. OSHA reasoned that a set trigger of one percent is more appropriate because it will result in consistent application and will account for the hazardous characteristics of chemicals at low levels. Only the weight of the covered chemical, not the total of the mixture, is counted, and it does not count the weight of chemicals in portions of the process where partial pressure of the chemical in vapor space under handling or storage conditions is less than or equal to ten millimeters of mercury. OSHA’s enforcement memoranda were challenged by several entities in several different venues, and ultimately were consolidated in the U.S. Circuit Court of Appeals for the District of Columbia Circuit. 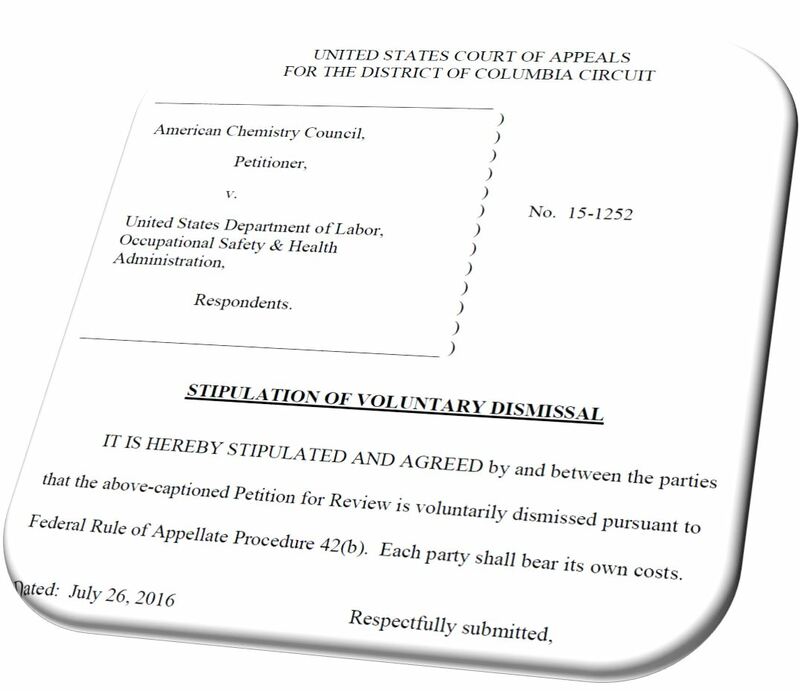 American Chemistry Council v. OSHA, et al., Case No. 15-1252 (D.C. Cir.). The primary basis for the legal challenge was the fact that OSHA made this significant change to the PSM standard by way of an interpretation memo, rather than formal notice-and-comment rulemaking. The challenge also focused on the arbitrary and capricious nature of the substantive change proposed; i.e., covering by the PSM Standard chemicals in such small concentrations that most did not present the hazard intended to be addressed by the PSM Standard. As part of a settlement brokered between OSHA and the ACC, on July 18, 2016, OSHA rescinded the June 2015 interpretation memorandum and replaced it with a similar but amended version. On July 26, 2016, the parties also filed a Stipulation of Settlement with the D.C. Circuit. with respect to chemicals for which no concentration is specified in Appendix A, the total weight of the chemical in the process at a concentration of one percent or greater. However, the employer need not include the weight of such chemicals in any portion of the process in which the partial pressure of the chemical in the vapor space under handling or storage conditions is less than 10 millimeters of mercury (mm Hg). The employer shall document this partial pressure determination. The new interpretation is different than the 2015 memorandum, however, in that it carves out any chemical listed in Appendix A as “anhydrous” where such chemical is part of an aqueous solution or aqueous mixture. OSHA states in the replacement memorandum that “[a]nhydrous” means ‘contains no water’ or ‘without water.’ Thus, by definition, Appendix A to PSM does not cover aqueous solutions or aqueous mixtures of chemicals specifically listed as ‘anhydrous’.” OSHA’s new interpretation also exempts from PSM coverage hydrogen chloride or hydrogen fluoride in aqueous solutions or aqueous mixtures even though those chemicals are not listed as anhydrous on Appendix A.
Hydrofluoric Acid, Anhydrous/ Hydrogen Fluoride (CAS 7664-39-3). The excluded chemicals nevertheless remain covered by the PSM standard when they are present in a process in anhydrous form at their threshold levels. OSHA’s new interpretation also states that aqueous mixtures of hydrogen bromide at concentrations below 63% and mixtures of alkyl aluminum at any concentration fall within the partial pressure exemption of the 1% Rule under all normal handling and storage conditions. OSHA had previously delayed enforcement of its original memo until the end of 2016. The new interpretation memorandum announces an interim enforcement policy that precludes OSHA from issuing citations until March 31, 2017 for violations of the PSM standard based upon the new memorandum. In the interim, however, OSHA may continue to issue citations based on the prior “commercial grade concentration” policy. OSHA will not conduct programmed inspections of such processes. OSHA will not cite an employer under the PSM standard for any PSM violations involving such processes provided the employer is making good faith efforts to come into compliance with the PSM standard by March 31, 2018. OSHA will consider efforts made by employers to be “in good faith” if they can demonstrate that ongoing efforts to comply with the standard are underway and documented. This policy does not apply in cases involving a fatality or catastrophe. Any citations involving PSM violations at such processes shall be submitted to the OSHA Regional Office prior to issuance to ensure consistency and clarity. For cases where the Regional Office needs assistance in its review, it shall consult with OSHA’s Directorate of Enforcement Programs Office of Chemical Process Safety and Enforcement Initiatives.